During your swing, there's a noticeable rotation of the forearms which, if done correctly, is coupled with the unhinging of the wrists to allow the toe of the club to catch up with the heel, thereby squaring your clubface at impact. Since good players have already committed these mechanics (the "what") to memory, when they go wrong, the problem is usually the "when." Timing can alter where the clubface is looking at contact. A good drill to help you sync up your arm and torso rotation for the all-important clubface control is to tee the ball and hit 7-irons with your legs crossed. Start with a short backswing and lengthen out as you feel more comfortable, but don't try for your normal distance. This drill is for technique, not power. The key is to let your forearms rotate back and through in response to the swinging of your arms, and let your chest do likewise. If you hook or pull the ball, you're over-rotating your forearms. If you slice or push it, you're over-rotating your chest. When you can hit the ball where you're aiming, your arms and torso are synched. It's a short swing, but notice that my chest and shoulders have rotated in sync with my arm swing. There's a space between the tree and my front shoulder that will be filled at impact in the next photo because I rotated. Notice also that the toe of my clubface points at the sky. If it doesn't rotate coming back to the ball, I'll make contact on the heel -- or worse. 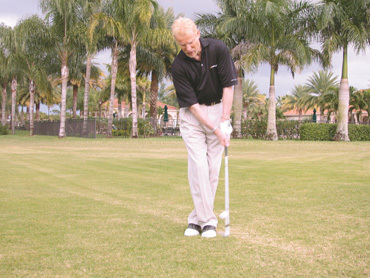 Concentrate on releasing the club with a soft but constant rotation of your body during the downswing. Don't hold your chest back, but let its turn be paced by your arm swing. When you do it correctly, you'll feel as if your arms are swinging past the midline of your body and the momentum generated by that action pulls your chest around.